Please help Kenneth with a gift of a tank of gas so he can take Our Lady and her message to homes across America! 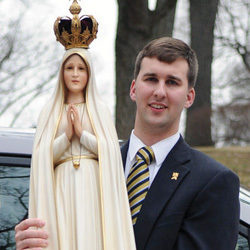 Kenneth Murphy is a personable young man, full of love for Our Lady. Being half Irish and half American, he has the Irish “twinkle” and the American “go-get-it” attitude. Kenneth has chosen to dedicate his life to spreading the Fatima message and devotion. 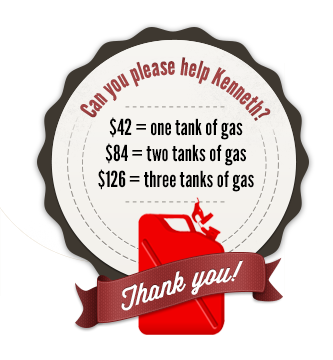 When you donate a tank of gas you will become Kenneth’s long-distance traveling partner. You will be sharing in his mission and in the merit of his work and prayers. This young man has given up much to make Our Lady of Fatima known. Will you please help him? By helping Kenneth stay on the road, you will be helping the Fatima Home Visit Program, which brings the Fatima message in full to many souls in need and helps them grow in devotion to Our Lady and the Rosary. Yes, I want to help support Fatima Custodians stay on the road and continue to take Our Lady's message of Fatima into homes across America. I want to help with a one time donation to help Kenneth stay on the road spreading Our Lady's message. I want to ensure Kenneth and other Fatima Custodians stay on the road throughout the year with my monthly donation. for the love of Jesus Christ. 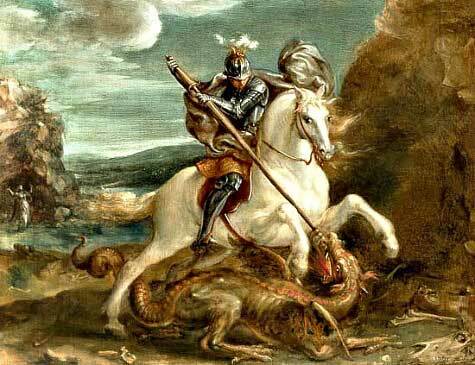 Though the story of St. George is intertwined with legend, especially the account of him slaying a dragon, the historicity of his life is certain. He was of Greek origin, seemingly of a noble, Christian family. His father was Gerondios, from Capaddocia, a prominent officer in the Imperial army. His mother was Polychronia, from the city of Lyda, now in Israel. As a youth, he lost first his father and then his mother, after which he enlisted in the Roman army under Emperor Diocletian. The latter favored him in honor of his father’s service, and George was made an Imperial Tribune. By imperial edict, Roman soldiers were forbidden to practice Christianity. Notwithstanding this prohibition, George loudly proclaimed himself a follower of Christ before the Emperor Diocletian and his fellow soldiers. Upset at the news, the Emperor offered George an abundance of earthly goods in exchange for his Christian Faith, but George was unmoved. He endured various tortures and was finally beheaded. The Empress Alexandra was converted by his courageous example, and some interpret that while the dragon often depicted being slain by St. George is the pagan Roman might, the lady in the background is the Empress. Devotion to St. George spread throughout Asia Minor, and already early in the fourth century churches were being dedicated to his honor. Throughout the history of Christian battles there have been reports of St. George’s heavenly assistance, Richard I of England and other Crusaders also confirming such intercession. It is not known how St. George was chosen as patron of England, though it is certain that his fame had reached the isle long before the Norman Conquest. There was once in the city of Toledo, Spain a soldier, Diego Martinez, and a young woman, Ines de Vargas, who were in love. 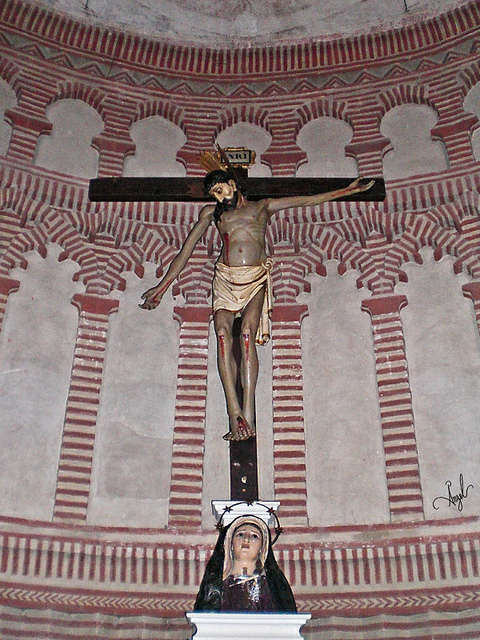 Diego was called to fight in Flanders, so, at Ines’ insistence, before a crucifix known as The Christ de la Vega, Diego solemnly swore to marry her on his return. With Diego gone, Ines felt lost and alone, and often sought solace at the foot of the Christ who had witnessed their solemn engagement. Years went by, Ines always on the lookout. One day, at the head of a returning cavalry, she beheld her fiancé. She screamed and rushed to meet him, but he feigned not to know her, and passed on. Successful in war and prowess, he had not only been promoted to captain, but had been knighted by the King, and no longer considered Ines a worthy prospect. There was a stunned silence. But, this was Catholic Spain, and finally, judge, Diego, Ines, court and the curious repaired to the Basilica of St. Leocadia* , which housed the carved Christ. Kneeling between Diego and Ines before the life-sized crucifix, Don Pedro held up a Bible and asked if He, Jesus Christ, Sovereign Lord, would indeed swear to the couple’s solemn vow to wed each other. At the same time, to the astonishment of all, the statue’s right arm, descended, its hand coming to rest on the Bible which the judge held up. So struck were Diego and Ines, that giving up all earthly plans, they entered religious life. As to the Christ de la Vega, to this day, His right arm remains in the same position, and, some affirm, His mouth slightly open in the utterance of His witness.